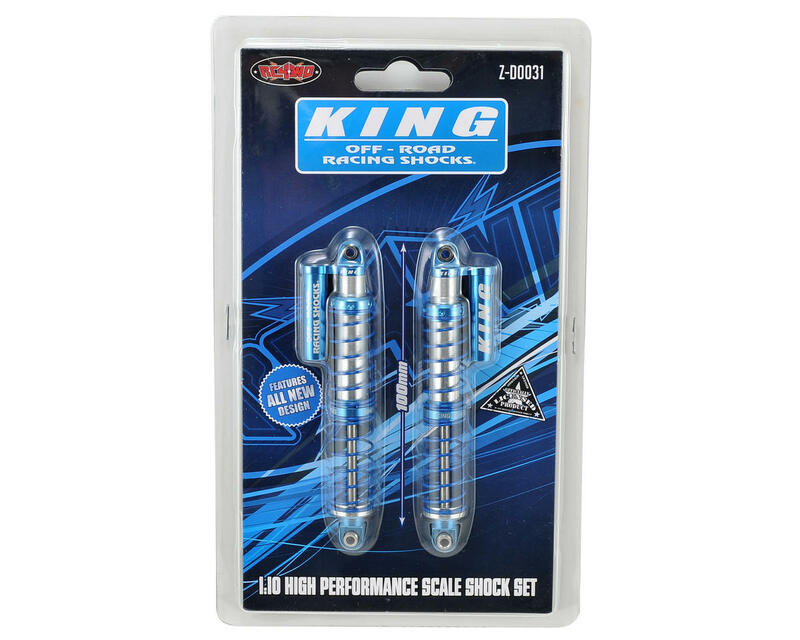 This is a pack of two RC4WD 100mm King Off-Road Scale Piggyback Shocks with Faux Reservoirs. These fully licensed King replica shocks have been re-designed from the ground up and are pre-built and ready to fill with the oil of your choice. These shocks are the perfect way to finish off any scale project that uses a 100mm long shock. Your scale build will never be the same once you bolt up a set of these awesome looking shocks. Mixed feelings about these. With the available extra springs, (sold separately), I am able to get these tuned just right for my SCX10 II, (which is considerably heavier than stock), and I was very satisfied for the first few weeks. However, the chrome completely peeled from one of the shock shafts after that time. I continue to run that shock, but it is now impossible to get a good seal, and oil leaks from around the shaft at a horrible rate, even with Green Slime. i’ve given up refilling it until I can get a replacement shaft. A second shaft has not peeled, but chrome has worn off, exposing copper underneath. It does still seem to hold oil, but the now exposed copper surface on the shaft is easily scratched, so it’s only a matter of time before the leaking starts. So, out of four shocks, two have shaft problems, while the other two are still in excellent condition. The truck has pretty much just run around on the lawn, some of that in snow and rain, but mostly it’s been dry conditions. I clean/lube frequently, but there hasn’t been much dirt/dust. There’s been nothing notable or overly gritty that would cause increased wear really, so I just got a bad couple of shafts I guess. My experience otherwise has been very positive, so I’ll give some replacement shafts a try. If this happens again with new shafts, I’ll have to be giving up on these however, unfortunately. There’s only so much I am willing to invest for such a short period of use, when that money could be going to other things on my wishlist. Great looking shocks, and thats about it. Really tricky to change oil on them, and even if you make it they dont perform well at all. 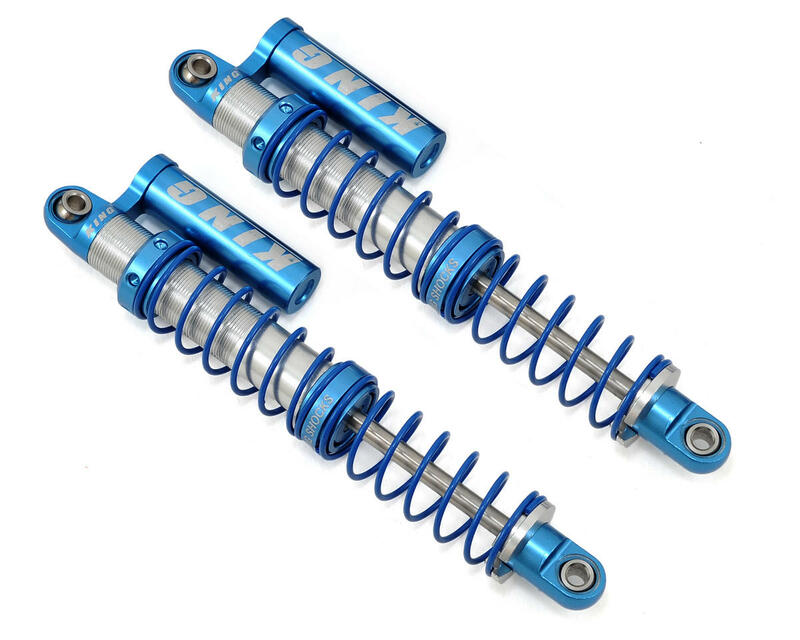 Should also been delivered with a single spring setup, because the ring between the 2 springs sometimes get stuck on the bottom of the shock body, and also catches a bit on the threading on the shock body.